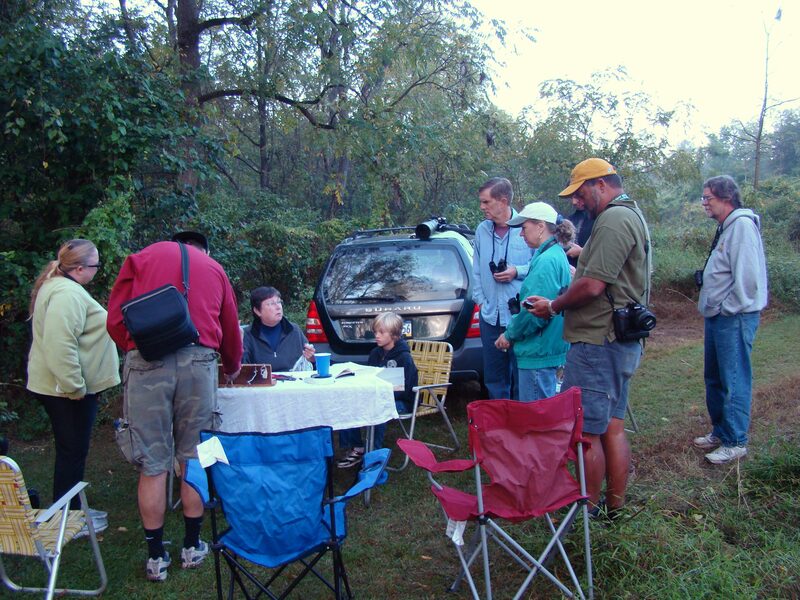 Last week, we held our annual bird banding program with Doris McGovern at the Bucktoe Creek Preserve. Doris is a master bird bander from Media, PA. We set the nets up early and had feeders stocked to bring in the birds. 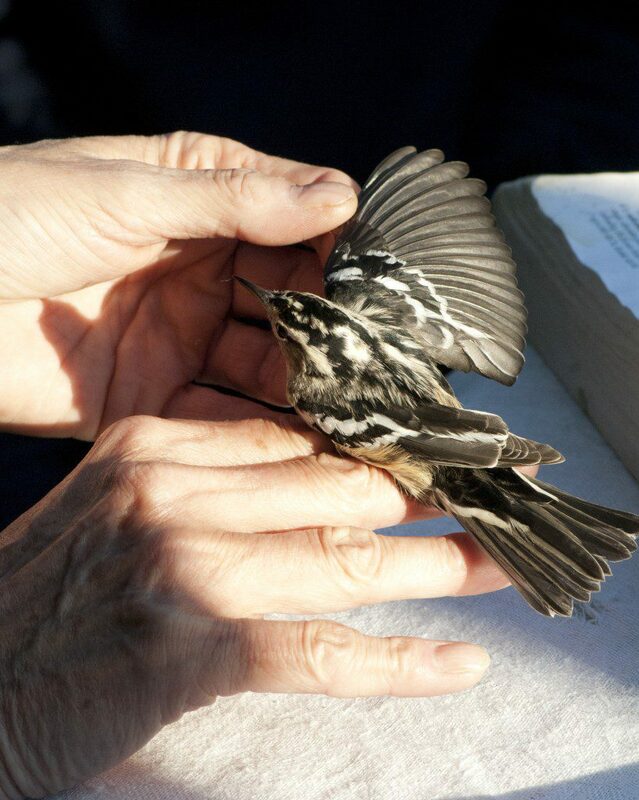 7 adults and 10 Teen Naturalists attended the banding session. Why are we doing this? Education and science. Educationally, by watching a bander work, you learn about feather molt, how to age a bird, migration, feeding and fat (put on for migration), comparative weights of birds, and bird conservation. 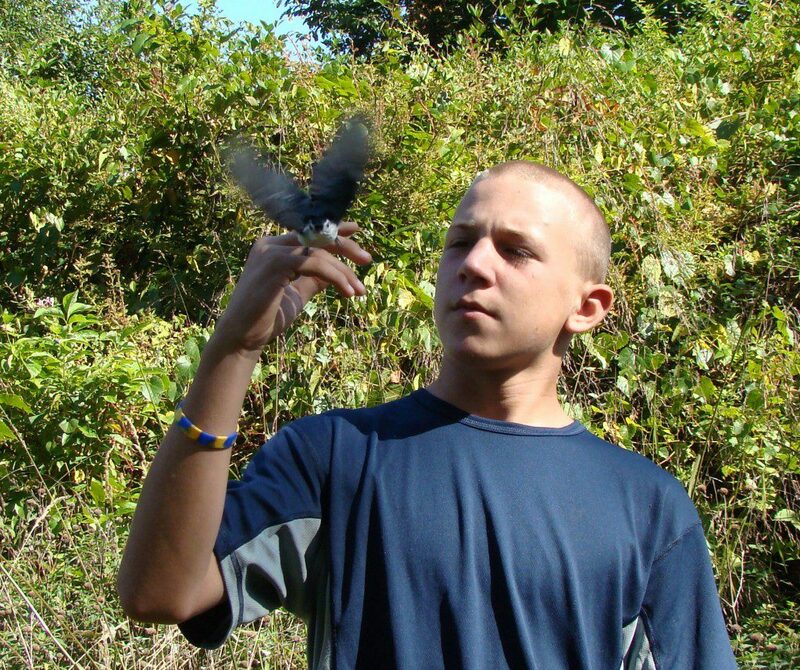 There is also nothing like holding and releasing a bird that can get someone excited and more interested in birds. For photographers, it is a great opportunity for bird close-ups. Scientifically, we are contributing to the understanding of bird sizes, migration patterns, age, and distribution. This year, we recaptured a Tufted Titmouse that had been banded at the location two years prior. Doris McGovern prepares to band a Tufted Titmouse. Each bird is carefully extracted from the mist net, which is so fine and thin, that the birds can’t see it. Next, they are aged, measured, fitted with a band with a unique number, and weighed. They are also checked for fat level, which is graded on a scale from 1 to 3. The fattest birds have plenty of energy for their upcoming migration. Most local, non-migratory birds have no extra fat at all. 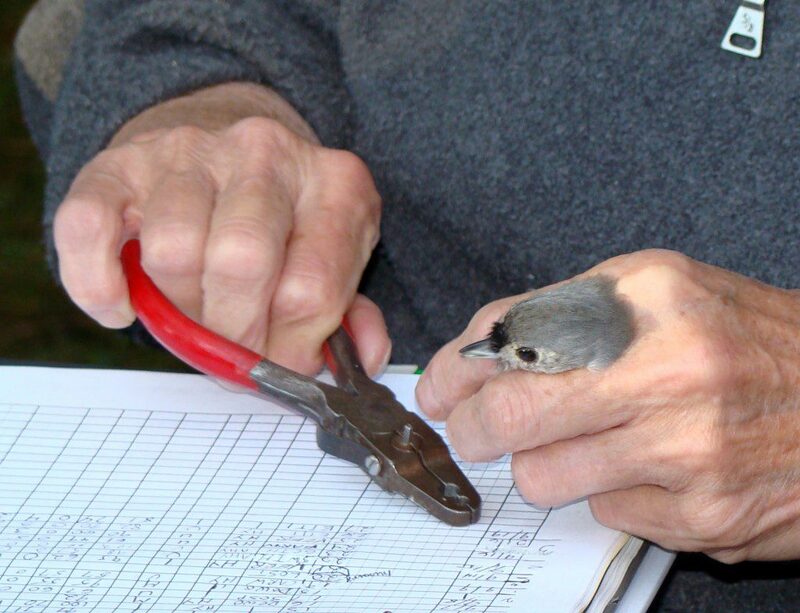 The unique number is catalogued with the US Geological Survey Bird Banding Lab. This is where the data is kept that was collected for each bird. If you ever find a band, or see a bird with a wing tag, neck collar, or other identifying marker, this is where you report your sighting for science. 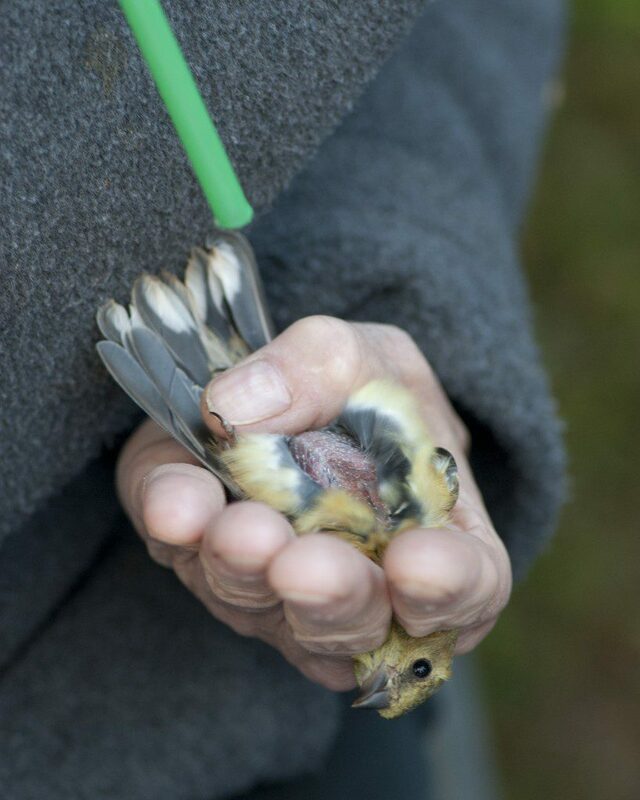 Air is blown through a straw to separate the breast feathers in order to examine the fat reserves on this American Goldfinch. This bird had no fat, which is typical for birds that are not storing it for long-distance migration. Photo by Hank Davis. In the course of our banding session, we had a steady stream of birds. Goldfinches, Carolina Chickadees, and Tufted Titmice made up the bulk of the birds caught. Other birds we netted included an Ovenbird, Chestnut-sided Warbler, Magnolia Warbler, Black-and-white Warbler, and White-breasted Nuthatch. A beautiful Black-and-white Warbler was a great surprise. Photo by Hank Davis. 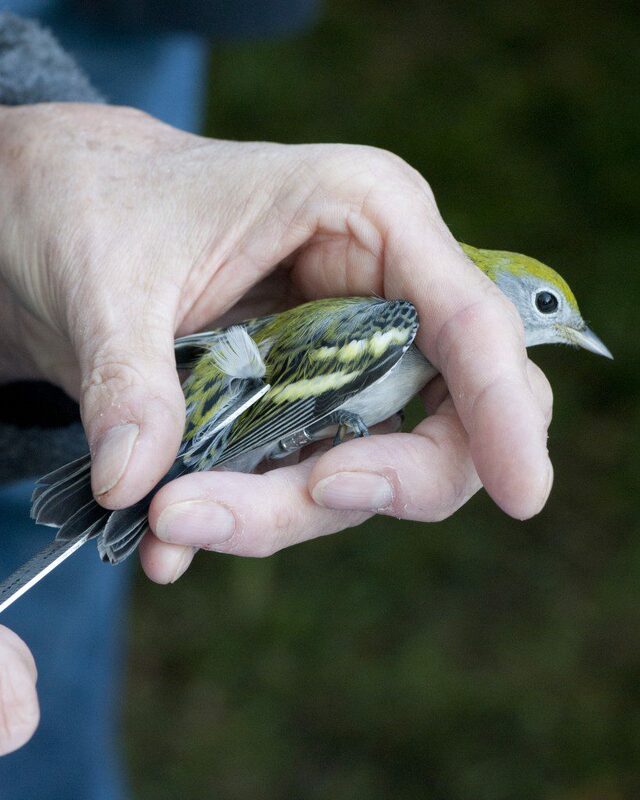 Bird banding exists not for recreation, but for science. Master Bird Banders like Doris McGovern train for thousands of hours before they are given the reins at a banding station. This is done so that birds are not injured and that everything is done to preserve their well-being, and that information is gathered in the correct way. In visiting the banding station, we got up-close looks at birds, and had the thrill of learning how to hold one correctly and release them. This is the educational part. Perhaps one of our participants was inspired enough to enter the field of science, or at least appreciate birds that much more. If you like eating a good diner-style breakfast and watching birds afterwards, you may enjoy the program next Wednesday. We hope to see you there. Register here. Enjoy a diner-style, full-plate breakfast at Ashland to start your day. Afterwards, take a walk to look for fall migrant songbirds like warblers, vireos, thrushes, and sparrows. Spend some time gazing skyward. It is the height of falcon migration after all! The title sounds exotic, doesn’t it? Nottingham…are we going to the U.K? Serpentine…sounds like there are lots of snakes. I thought there were no snakes in Great Britain. Oh, sorry, that’s Ireland. Barrens? What is that? Sounds depressing and empty. Last week I co-led the above field trip with Janet Ebert, local freelance botanist. Instead of going to a depressing, snake-infested city in the U.K., we took a 40-minute drive from the Ashland Nature Center to a wonderfully biodiverse, endangered species-rich ecosystem near Nottingham, Chester County, Pennsylvania. This is a place that really gets a naturalist’s heart-a-thumpin’. Our walk focused on botany and geology of the area. Here is what you need to know about Serpentine Barrens: they are rocky, dry places with soils high in toxins like magnesium and zinc and low in potassium, nitrogen, and phosphorous…the bread of life for plants. Botanically, these barrens are like stepping into a foreign world. There are no towering tuliptrees and red oaks here or most of the other plants that are familiar to you in our local woodlands. Say hello to prairie grass, pitch pines, post oaks, blackjack oaks, and a myriad of wildflowers you probably have never heard of. 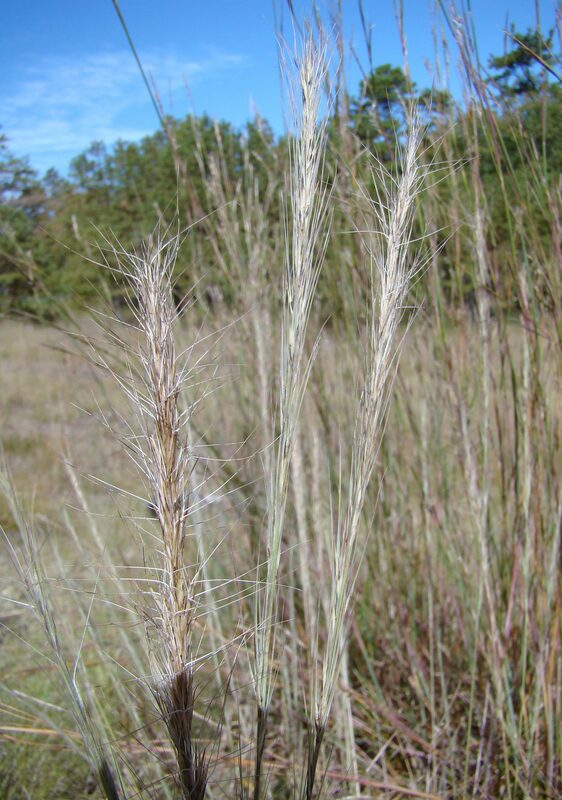 In a remnant native prairie within the barrens, we identify a type of three-awn or poverty grass called Aristida dichotoma. 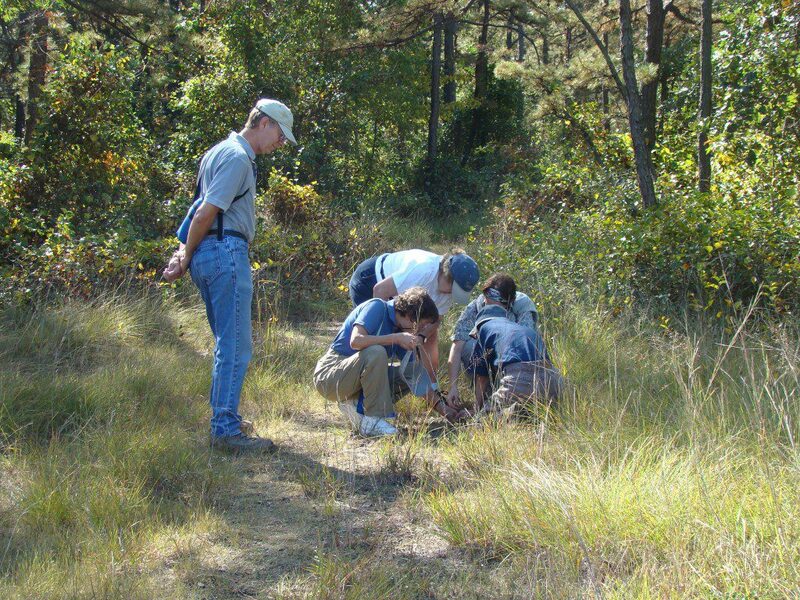 The Delaware Nature Society leads one or two trips to nearby serpentine barrens annually. 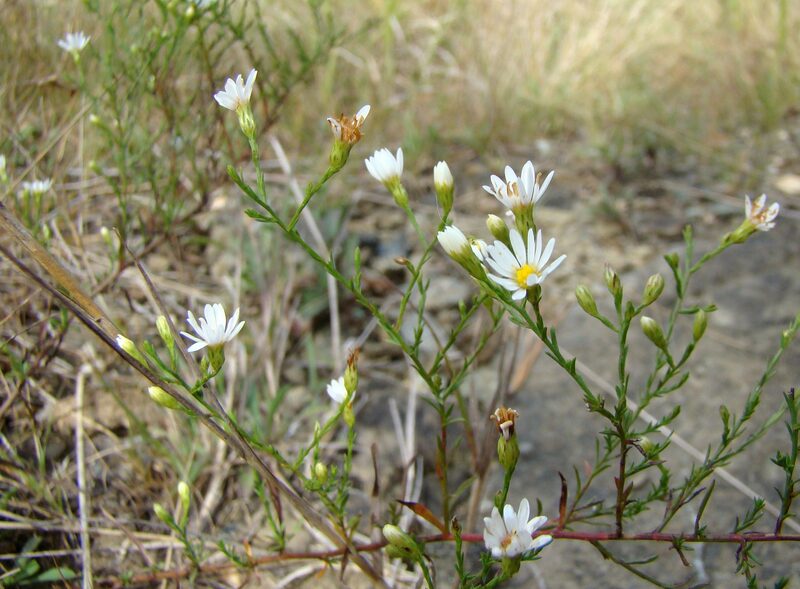 Botanically, the flagship species for this habitat is the serpentine aster, Symphyotrichum depauperatum, whose worldwide existence is within the barrens of our local area. 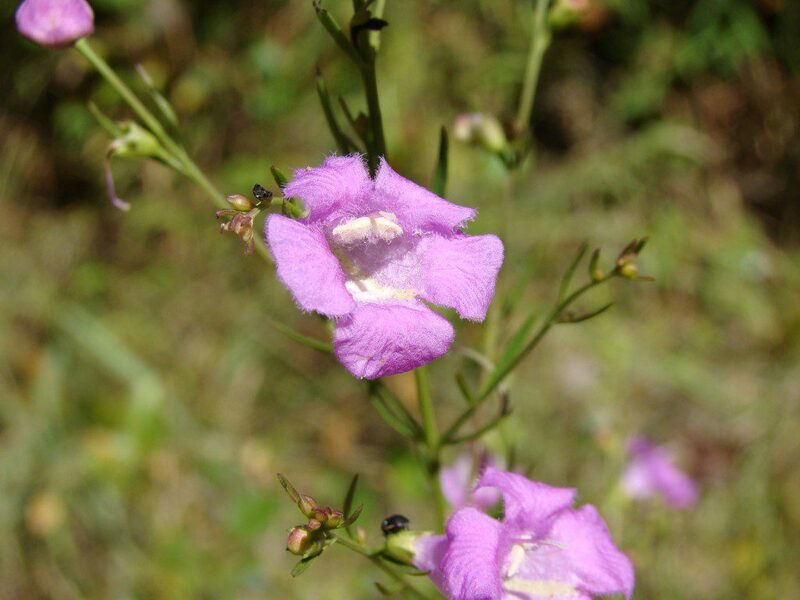 Although recently, this species has been found in a disjunct ecosystem in North Carolina. Other unusual wildflowers were identified by botanist, Janet Ebert. My favorite plant of the day was the starry campion, Silene stellata. 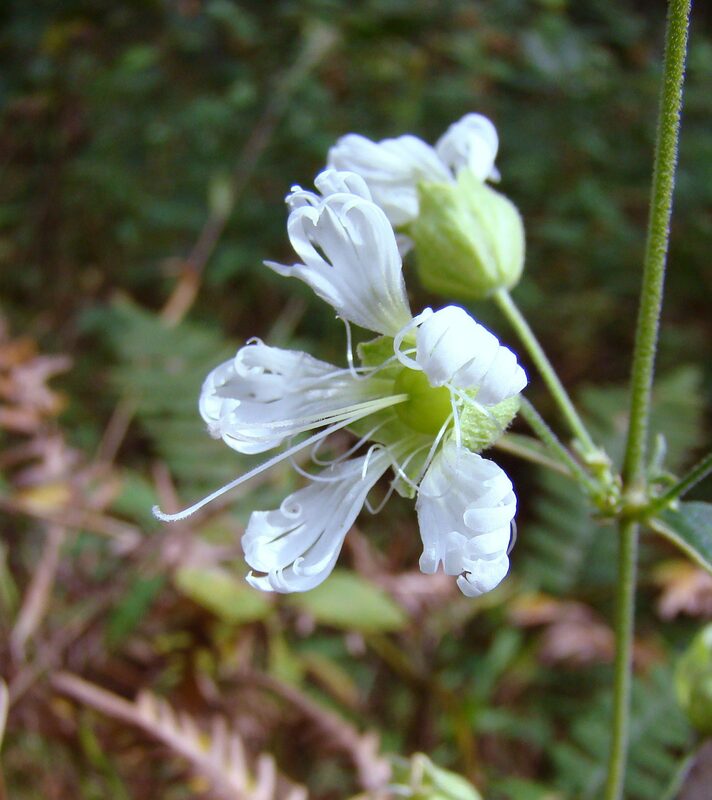 I usually see the white campion, Silene latifolia around here, which is not native. Other native wildflowers that we found include New York ironweed, calico aster, boneset, oxeye (Heliopsis helianthoides), slender gerardia, gray goldenrod, whorled milkweed (in fruit), giant sunflower (Helianthus giganteus), and many others. Yes, I realize I am inconsistent with my scientific name use. The grasses at the Nottingham Barrens are very diverse, and Janet Ebert identifies them confidently, sometimes using a small magnifying glass to see tiny details. We started off easy…Indian grass, little bluestem, and panic grass of some sort. Deer tongue grass was very distinctive. Can you guess what it looks like? We found the rare prairie dropseed (Aristida purpurescense), which is an endangered plant in PA, along with its more widespread cousin, poverty grass (Aristida dichotoma). These are small, beautiful and delicate grasses more at home on the wide-open prairie of the mid-west, but here they are…a relict of a different age thousands of years ago. Several of the grasses and many of the other plants here at the barrens have remained through time, as the landscape around them changed since the last ice-age. The rock and barren soil is their guardian against being out-competed. Their trick?…Survive where no one else can. Note: Program meets at Bucktoe Creek Preserve. Identify and learn the natural history of the little-known mosses and liverworts with a local authority on the topic. Start your experience at the Bucktoe Creek Preserve and take a slow-paced walk to identify several species. After lunch, travel to another nearby area to see species that live in cool, north-facing slopes and ravines. 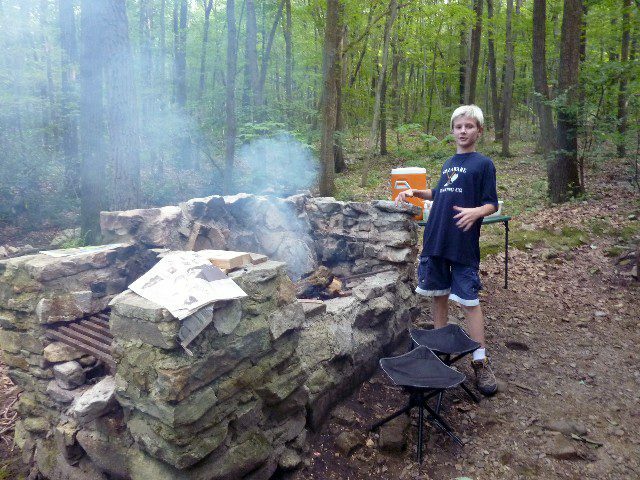 Bring a lunch and a drink, and meet at the Bucktoe Creek Preserve. All participants will receive a free copy of the author’s book. Register here. 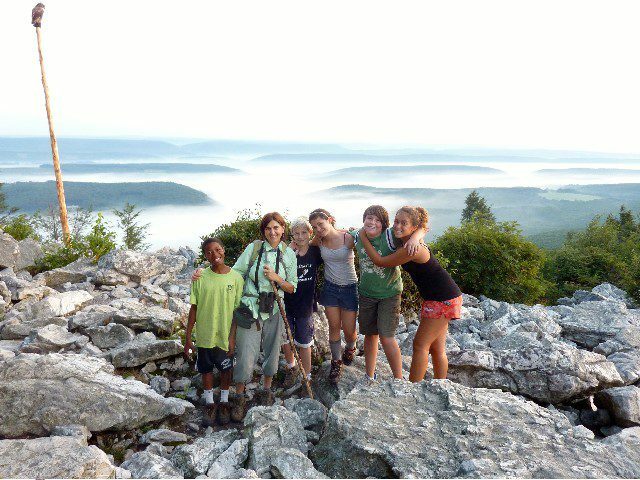 During the last week of the Delaware Nature Society summer camp, I took a group of 12-16 year olds to Hawk Mountain Sanctuary for the perfect combination of adventure, stewardship, and science. It was the first week of the fall migration raptor count there, and we were able to meet with scientists who were counting raptors flying past the mountain as well as those who are working around the world on raptor conservation. Keith Bildstein was just back from trapping and monitoring vultures in Kenya, and he graciously gave us an afternoon showing us how to trap a vulture and sharing some of the cutting edge research regarding Black and Turkey Vultures. We climbed three miles to a trail that has been redirected to help restore the old path to its natural conditions. Since this was at an elevation of 1,300 feet, just getting to the site was an adventure. We stopped at the River of Rocks to explore and look for Timber Rattlesnakes (no luck). 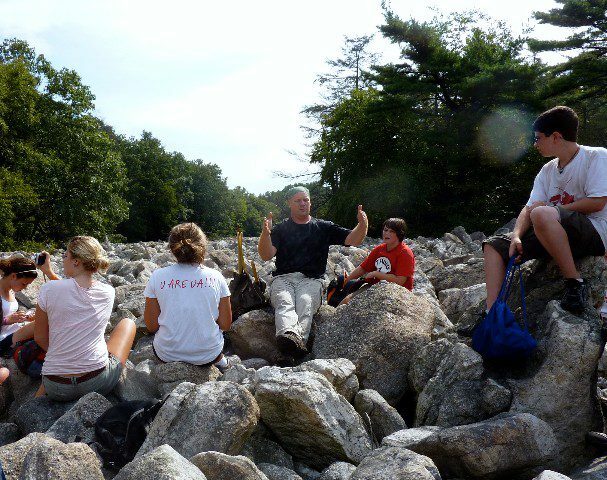 Todd Bauman, the Director of Land and Facilities, was in charge for the day, telling us the geologic history of the River of Rocks and directing us in our stewardship project. Learning about the River of Rocks. After spending several hours transporting mulch and leaves to cover up the old trail and stabilize it, we were tired, but still had the hefty walk back to the vehicle which would get us back to our camp. 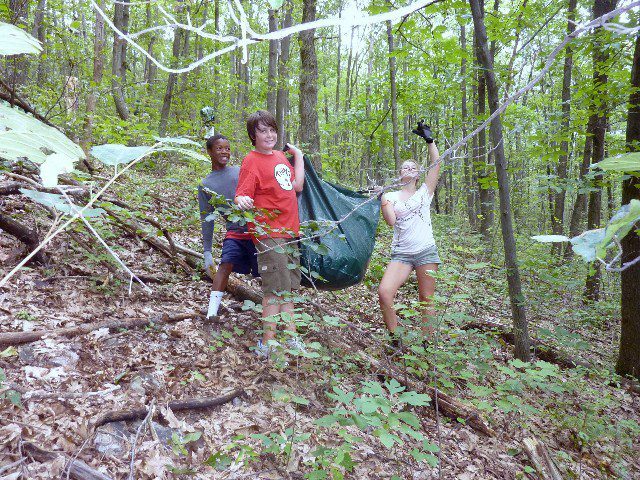 Working on a trail at Hawk Mountain Sanctuary. 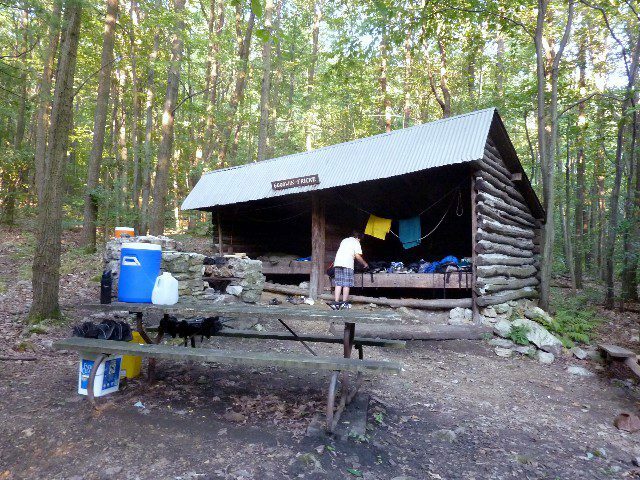 Camp consisted of two Adirondack shelters with great stone fireplaces. We cooked our meals on camp stoves and over the open fire, but had the advantage of not having to put up and take down tents. Here is the shelter where we stayed. Doing some work around the fire is everyone's favorite part of camping! 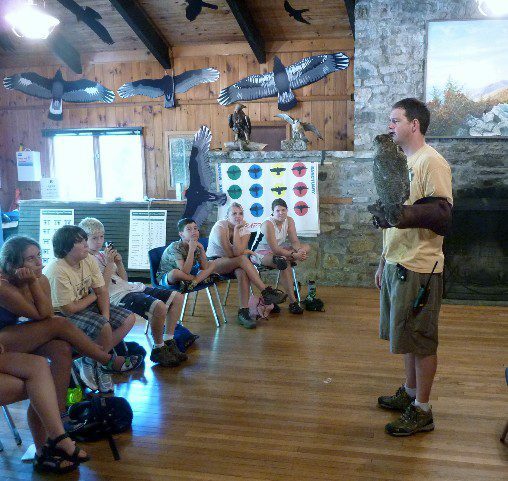 One day we met Jeremy, part of the education staff, who brought along an American Kestrel and a Barred Owl. We had heard the Barred Owl during a night walk and were reminded that raptors live around us year-round in addition to just migrating through. Jeremy, from the Hawk Mountain Sanctuary education department shows us a live Barred Owl. 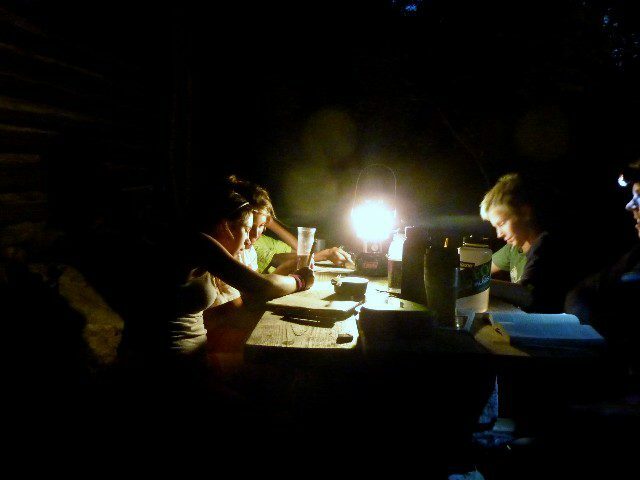 Evenings are always cozy and social , and other than the night walk, we told stories, played ‘Hearts’ and took time to work on our journals by the light of the Coleman lantern. Evenings around camp are filled with cards, conversation, and writing in our journals. On the last morning, we decided to get up before dawn and walk to North Lookout for the sunrise. We packed bagels and binoculars, and made it to the top before the Hawk Mountain staff. The view was worth it. We saw the sunrise at South Lookout before climbing higher to North Lookout where the clouds blanketed the valley like white velvet. We ate our bagels and counted the early birds flying past. We were able to give our count of chimney swifts and cedar waxwings to the counter when she arrived and our data was entered into the official Hawk Mountain log. An amazing view from early morning at Hawk Mountain Sanctuary's North Lookout. This was the last camp of the summer for all of us and it was a perfect end of summer adventures with the Delaware Nature Society. A Monarch caterpillar munches on a milkweed leaf at Ashland. Photo by Hank Davis. Right now, the last generation of Monarch butterflies in our region are completing their life cycles. The Monarchs we are seeing now are likely three to four generations removed from their ancestors that arrived here in early summer. Last week, photographer and DNS board member Hank Davis captured an amazing series of images of Monarchs in all different stages, all in one tiny island in the middle of the Ashland parking lot! 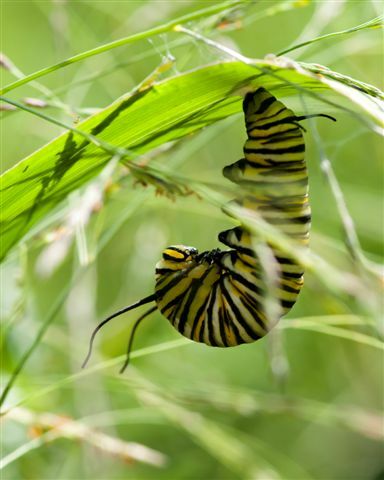 A Monarch caterpillar hangs upside down in a typical "J" shape prior to forming its chrysalis. A freshly-formed Monarch chrysalis hangs from a goldenrod stem. Photo by Hank Davis. 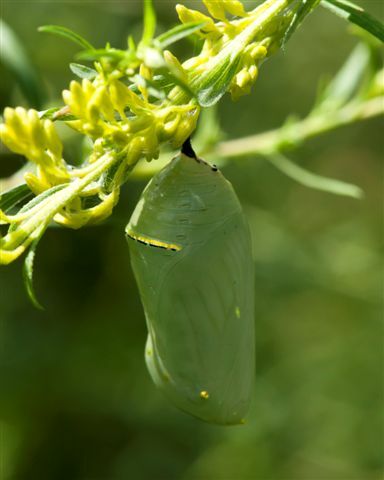 The magnificent chrysalis is actually the last skin that the caterpillar will wear, and where it will spend the next 10-15 days transforming into a butterfly. 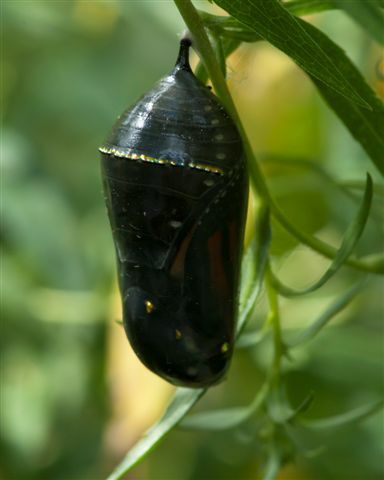 A Monarch chrysalis "ready to hatch" with the dark orange wings of the adult butterfly visible inside. Photo by Hank Davis. The hardened skin of the chrysalis is an opaque pale green color until it is time for the adult Monarch to emerge. Then the skin becomes becomes transparent and the butterfly breaks free. 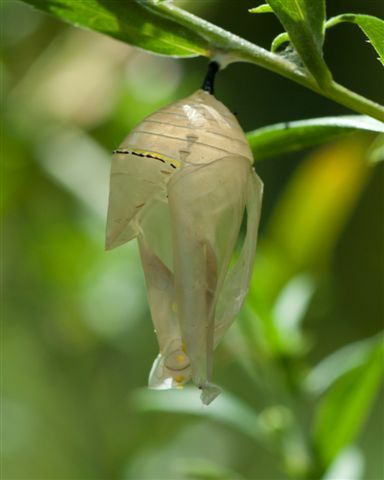 After the adult Monarch emerges, all that is left is the paper-thin chrysalid case. Photo by Hank Davis. The abandoned chrysalis looks and feels like tissue paper, and retains the wondrous gold and black speckling ringing the top. 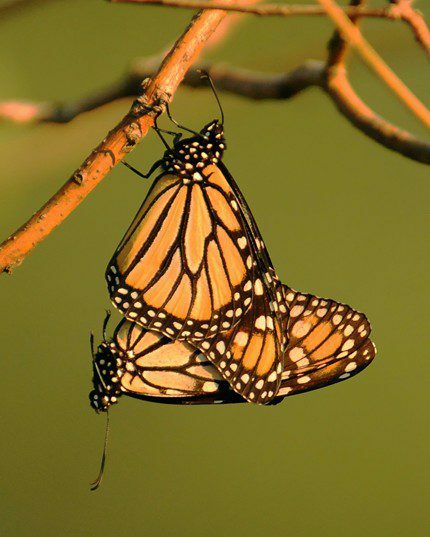 This is how the next generation of Monarchs starts: a mated pair of Monarchs. Image by Derek Stoner. 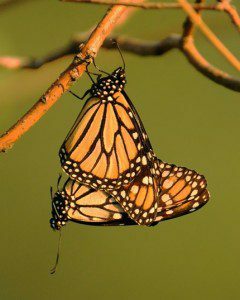 The adult Monarch will hang for hours drying its wings, and finally set forth on its first flight to find nectar sources. The twist, however, is that this generation is “programmed” to migrate south all the way to ancestral wintering grounds in the mountains of central Mexico. How do they accomplish this amazing feat? We don’t know the full answer! 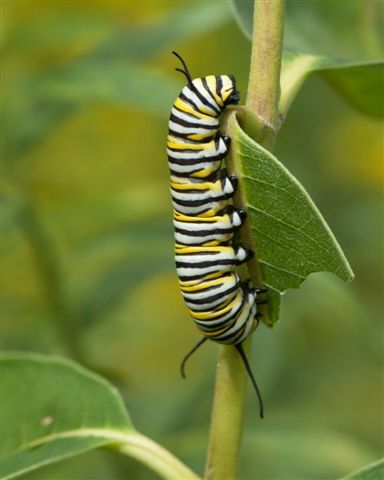 If you’d like to learn more about Monarchs and explore their world, we invite you take part in the Monarch Migration Celebration this Saturday, September 18, from 10:00am to Noon, at the DuPont Environmental Education Center in Wilmington. On Saturday, September 25, from 2:00 to 4:00pm, families can take part in the Monarch Migration program at Burrows Run Preserve, where we will capture, tag, and release Monarchs on their way to Mexico. For more information about these programs, please visit www.delawarenaturesociety.org.